Gold Muchalat Provincial Park, located northwest of Gold River on central Vancouver Island, offers a pristine wilderness environment for sports fishing, wildlife viewing and rustic hiking. This undeveloped park provides key winter habitat for Roosevelt elk and black-tailed deer and is home to the Marbled Murrelet and a variety of fish species. Sockeye salmon spawn in the Muchalat River. 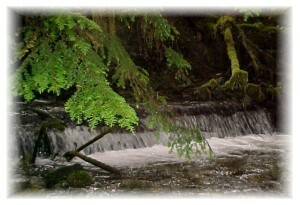 Summer steelhead, Rainbow trout and coho can be found in both the Muchalat and Gold Rivers, which run through the park. A trans-valley corridor of old-growth Douglas fir and Western hemlock is protected within the boundaries of this rugged park, which has no developed facilities. A user-made trail meanders along the river's edge and deactivated logging roads allow foot access into the more heavily forested areas of the park, which was established in 1996. Logging trucks frequently travel through the park. Use caution when traveling on logging roads. Drive with headlights on and be prepared to pull over out of the way of the logging trucks. Logging trucks have the right of way at all times. Bring your own drinking water as potable water is not available in the park. Surface water from the river and streams must be well boiled, filtered or treated prior to consumption. Swimming the Gold and Muchalat Rivers is not recommended due to strong water flow. There are no lifeguards on duty in provincial parks. The park is located on the Gold and Muchalat Rivers, approximately 15 km northeast of the town of Gold River on north-central Vancouver Island. Access is via the road to Woss Lake from Gold River. Other logging roads run through the park. Conservation/Wildlife - Gold Muchalat Provincial Park protects important habitat for the Marbled Murrelet, black-tailed deer and Roosevelt elk. Sockeye salmon spawn in the Muchalat River, while summer steelhead, Rainbow trout and coho can be found in both the Muchalat River and Gold River. A trans-valley corridor of old-growth Douglas fir and Western hemlock are also protected. White water kayaking and rafting are pursued on the waters of the Gold and Muchalat Rivers. Bicycles must keep to roadways. Bicycle helmets are mandatory in British Columbia. Be aware that logging trucks frequently travel on the roads in the park. Steelhead, rainbow trout and other Pacific salmon species are found in both the Gold and Muchalat Rivers. Anglers should be aware of closures in this area and check the check the current regulations issued by Fisheries and Oceans Canada prior to fishing. Anyone fishing or angling in British Columbia must have an appropriate licence. There are no maintained trails in this park, however visitors do use game trails to access riverside areas. The park is open to hunting. All hunters to the area should refer to the current BC Hunting and Trapping Regulation synopsis. Pets/domestic animals must be under control at all times and are not allowed in beach areas or park buildings. You are responsible for their behaviour and must dispose of their excrement. Chances of spotting Roosevelt elk are quite good at Gold Muchalat Park. While fires are allowed, we encourage visitors to conserve the environment by minimizing the use of fire and using stoves instead. If you must use a campfire, please practice “Leave No Trace” camping ethics. Please be responsible with your fire and be aware of fire closures. This park is open year-round; however the roads may become inaccessible in the winter due to snowfall.